Density Altitude: Pressure Altitude corrected for non-standard temperature. That’s the book definition of density altitude. The problem is, that definition leaves a lot of general aviation pilots scratching their heads. What really is density altitude? All airplane engines rely on air and fuel mixing together, then that mixture is ignited to create combustion. Normally aspirated piston engine airplanes get their best performance at sea level, where the air is nice and thick, allowing plenty of air molecules to get sucked in the engine intake. As a normally-aspirated airplane climbs, the ambient air pressure drops with an increase in altitude (the air gets thinner, less dense), thereby reducing airplane takeoff, climb, and landing performance. There just isn’t as much air at higher altitudes, to put it simply. Turbo charged piston engines assist with this air density problem. A turbo charger boosts the air coming into the engine and fools the engine into thinking it is at sea level pressure all the time. The higher the altitude, the faster the turbo charger spins, spinning the compressor faster, which compresses more air to continue to give the engine sea level pressure air. This gets faster cruise speeds the higher you go. Both normally aspirated & turbo charged engines do experience longer takeoff rolls and reduced climb rates at higher airport elevations & higher altitudes. How does this all relate to density altitude? When the outside air temperature rises, the air becomes thinner, less dense. This means that when an airport elevation is 1,000 feet, but the density altitude is reported as 3,000 feet, the airplane engine thinks it is at 3,000 feet. It won’t accelerate as fast. The airplane’s climb rate will also be reduced. That means that the normal climb pitch attitude a pilot is used to seeing won’t be accurate at higher density altitudes. 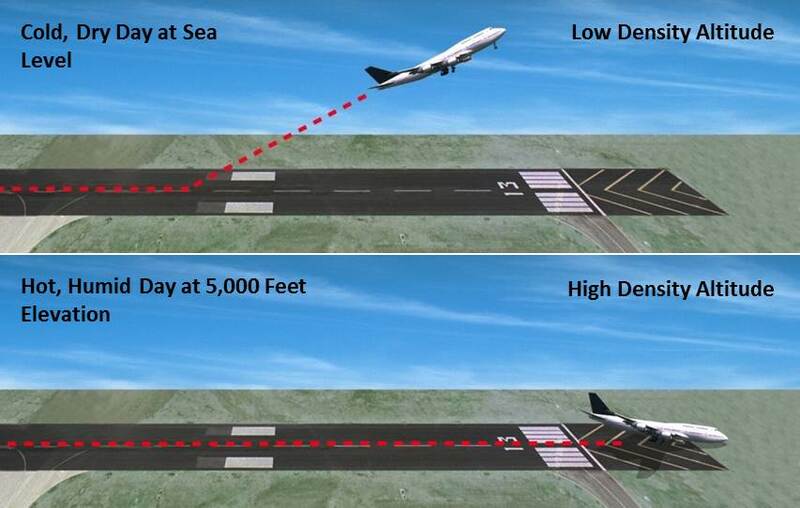 It will lead to slower indicated airspeeds, slow enough to potentially lead to a stall if a pilot isn’t paying attention. Where does this get dangerous? High elevation airports. Whenever the OAT creeps above 85 or 90 at an airport that is higher elevation (I would classify higher elevation as 2,500 feet or higher), the corresponding density altitude sky rockets. If a pilot isn’t paying attention to airspeed or angle of attack (if the airplane is equipped with an AOA), a stall can come very quickly on climb out. What to take home from this? Monitor your climb speed and angle of attack, especially right after takeoff, when you hear density altitude on the ATIS or AWOS.